Leave it to Superman to save the day after a terrible week for superhero comics. The problem wasn’t the quality of the comics, but the decisions of fans, creators, and editors, both past and present. A number of controversies over the past few days made it impossible to keep up with superhero news without running into waves of outrage from a number of different groups within the fan community. These developments highlighted areas where the industry desperately needs to improve. Treatment of women in the superhero comics climate became an even bigger issue when writer Valerie D’Orazio went public with her story of the online harassment she received from Chris Sims. Writer and journalist Sims had just been announced as a co-writer on X-Men ’92, Marvel’s Secret Wars tie-in revisiting the world of the ’90s X-Men cartoon. (Sims issued an extensive apology at Comics Alliance, where he has a weekly column, but by then the controversy had already blown up.) These stories dominated the superhero news cycle for good reason. They address a lot of the negative qualities of superhero comics and fandom—qualities that have been attacked by some in the community this past week, bolstered by others—and spark debates that need to be had in order to ensure the longevity of the industry. Superhero comics need to become more inclusive if they are going to thrive, and developments like DC’s new directions for Batgirl and Catwoman and Marvel’s work with a number of female characters (Captain and Ms. Marvel, She-Hulk, Spider-Gwen, Silk, and more) have helped makes superhero comics more inviting to female readers. These publishers are realizing that women are consumers too, and they’re more likely to hand over their money if they see better depictions of female characters. This hasn’t necessarily translated into a huge surge in sales for the comics industry, but change takes time. The efforts being made by Marvel and DC will pay off tomorrow if these companies truly commit to better female representation. And as the number of female fans grows, the community needs to learn to respect their opinions and find ways to weed out the sexism and harassment that have been happening for far too long. Much has been written in the last few days about the issues brought up by these recent controversies. Opinions have been considered, apologies have been issued, and discussions are still ongoing (some more civil than others). In this rush of negative events, superhero comics could really use a story that spotlights the positive aspects of the genre. That’s what Superman #39 offers. The final issue of the heavily publicized run teaming writer Geoff Johns with veteran Marvel artist John Romita, Jr. on his first DC Comics ongoing, “24 Hours” looks at what Clark Kent does when he’s left powerless for an entire day. The issue is a testament to the inspiring power of superheroes that emphasizes the potential within all humankind to do good: the exact kind of message the industry needs to hear right now. Following the discovery of a new superpower in Superman’s “super flare” (an extension of his heat vision that uses all the solar energy stored in his cells to unleash a devastating explosion), the hero is powerless until his cells recharge after a day in the sunlight. But Clark Kent has some help on his first day as an ordinary guy. At the end of last issue he revealed his secret identity to his best friend Jimmy Olsen, who beats himself over the head for not looking past the glasses (which change Clark’s eye-shape and dull the color) but is still incredibly excited at the news. This new dynamic is a great move for both characters, giving Clark a non-superhero confidante in his civilian life and giving Jimmy a more essential role in the narrative. Their friendship is at the core of this week’s heartwarming issue. So much of DC’s New 52 relaunch was about forcing change, and Superman got hit hard. His marriage with Lois Lane was dissolved; he was considerably de-aged (as was nearly every other character thanks to a timeline that fit the entire history of superheroes in five years); he left his job at the Daily Planet to launch a news website with Cat Grant; and he started dating Wonder Woman. The character hasn’t felt like his classic self, and while strong work has been done with this new iteration of the character (specifically in Greg Pak and Aaron Kuder’s Action Comics), it’s time for the Superman to come back. Johns took a number of steps to make that happen. He introduced a new character that riffed on Superman’s origin, allowing the writer to explore the fundamental elements of the character in his first story arc. He also brought Clark Kent back into the Daily Planet’s orbit, returning to the status quo but with a twist, thanks to the new Clark and Jimmy relationship. Pairing Johns’ scripts with John Romita, Jr. and Klaus Janson’s artwork (with colors by Laura Martin and Hi-Fi) accentuated the classic feel, providing superhero visuals that could easily be from an issue published 30 years ago. The art is a dramatic departure from the New 52 house style that uses Jim Lee as a visual foundation. While it’s not necessarily as clean as a lot of DC’s other books, the art’s vitality creates incredible energy on Superman’s pages. Romita, Jr. understands how to create tension on the comics page and is able to deliver some gorgeous spectacle working with such a powerful character. Janson’s inking adds texture while sharpening Romita’s storytelling. These men come from an older school of comic-book art, and that retro sensibility works extremely well with Johns’ take on the character and his world. 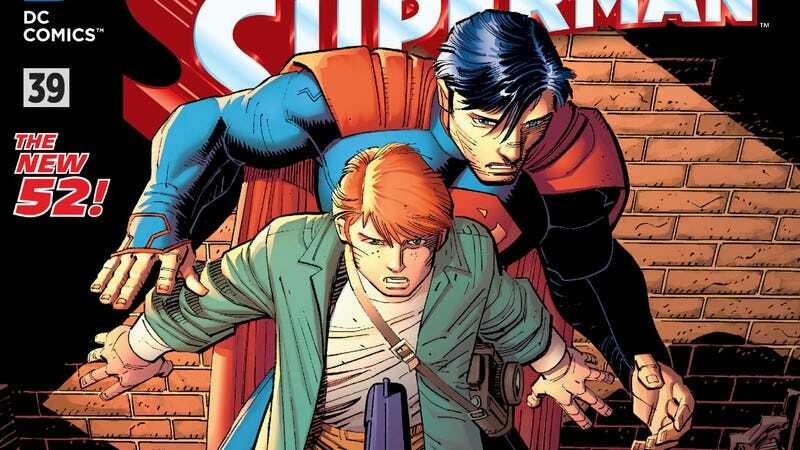 The big hurdle with Superman’s character is finding a way to make readers empathize with someone with so much power. It’s hard for Superman to relate to the normal human experience; that’s where the super flare comes in handy, even though Superman is already so strong that he doesn’t need even more devastating power. But the consequences of using the super flare open up a huge number of storytelling possibilities for writers who want to explore what makes the character a hero beyond his superpowers. And that’s what Superman #39 does. Even without his powers, Clark Kent is always ready to jump into action to help his fellow man, whether it’s saving a boy who falls out of a tree while reaching for his stuck kite, or stopping a man who has robbed a store and taken a hostage. Clark gets a cut-up elbow while saving the boy from the tree, but the stakes are much higher in the second situation when a powerless Superman steps in front of the criminal’s gun. Using just the power of his words and his presence, Superman talks the man down from doing something stupid and convinces him to surrender, then shakes the man’s hand after he apologizes. That compassion is what Superman is all about, and the larger superhero fan community should pay attention to the example set by his character. Superman listens to people, respects their opinions, and considers how his actions will affect others because he knows how much power he has. This week’s controversies have shown how much the real world needs fictional characters that fight for those kinds of benevolent beliefs. Superman #39 tells readers that they don’t need alien powers to be a fighter like Superman. As Jimmy and a newly repowered Clark sit on top of the Daily Planet building eating a fast-food dinner, Jimmy asks, “How’d it feel to be human for a day?” Clark responds, “To be honest, Jim, not as different as I thought it would.” That line can be interpreted in different ways: Clark could be saying that his new experience affirms the strong grasp he has on his humanity when he’s superpowered. But it could also mean that when he was a regular human, he felt as extraordinary as he does every other day. Every person has the strength inside them to be super in their own way, but that strength can also be used to hurt others and keep them from realizing their own potential. Despite the outcries of those who don’t want superhero comics to change, both DC and Marvel have taken steps in the last few years to bring in more diverse talent. But those steps need to become strides if the industry is going to evolve and thrive. (As great as Superman #39 is, all the creators and major characters of the story are white men with the exceptions of Lois Lane and Laura Martin.) As the superhero comics climate changes, everyone, from fans and journalists to creators and editors, should keep the lessons of this issue in mind: Listen, respect, and act in a way that doesn’t hurt others. These may be antiquated ideals in a world where people can yell as loudly as they want from their online platforms, often under the protection of anonymity. But as the past week has shown, they’re still as important as ever.